Physical Therapy for Lower Back Pain from SI Dysfunction | Podiatry Associates, P.C. What Is the Cause? How Does It Develop? How Do You Treat It? 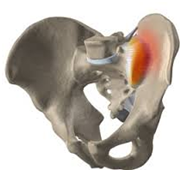 Your Sacroiliac (SI) Joint is where your sacrum meets your ilium, and it is a common location of dysfunction. Your sacrum is the triangular shaped bone below your lumbar spine (lower back). You have two ilium – a left and a right, which are your two large pelvic bones. Lower back pain is often due to, Sacroiliac dysfunction. 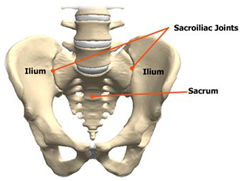 Sacroiliac dysfunction can include rotation, slippage, or translation of the ilium on the sacrum. Or less commonly, torsion or side bending of the sacrum on the ilium. Any of these motions, can cause your SI joint to get stuck in an abnormal position. SI dysfunction is a painful and aggravating diagnosis, but being knowledgeable about the condition and seeking the right treatment can help. Core Stabilization – your Transverse Abdominis (your deepest abdominal muscles) acts like a natural back brace and is the most important muscle to have strong for SI stabilization. Stabilization Belts – They offer added SI Joint stabilization while you work on engaging your core and improving your hip strength. The Com-Pressor™ Belt sold on the OPTP website offers maximum SI Compression, giving you added stability while you gradually reincorporate the activities you enjoy. You can even wear this belt while running and it will stay in place. By putting in an effort to gain SI stabilization through physical therapy, you can prevent future SI Dysfunction from occurring again. Keep your core strong and maintain that hip strength you’ve worked so hard to gain. If you are interested in setting up an appointment with our physical therapists at Castle Pines Physical Therapy or Cherry Creek Physical Therapy, call today at 303-805-5156 or contact us online.